Palestinian factions Fatah and Hamas are supposed to have reconciled for the first time since they were at war in 2008, But the reconciliation has been fraught with problems. And now, the participants have canceled a high profile meeting scheduled for Tuesday to announce a new "unity government," according to Gulf News. The immediate disagreement triggering the cancellation is a dispute over the choice of Prime Minister of the unity government. Mahmoud Abbas, president of the Palestinian Authority and Fatah leader, insists on nominating Salam Fayyad, a U.S.-educated internationally respected former World Bank economist who currently heads the Palestinian government in the West Bank. It's believed that a Fayyad government would reassure Western leaders who are concerned about having to deal with a unity government containing Hamas. But Hamas is dead set against Fayyad being any part of the unity government, and considers him to be a criminal traitor because he's negotiated some agreements with the Israelis. 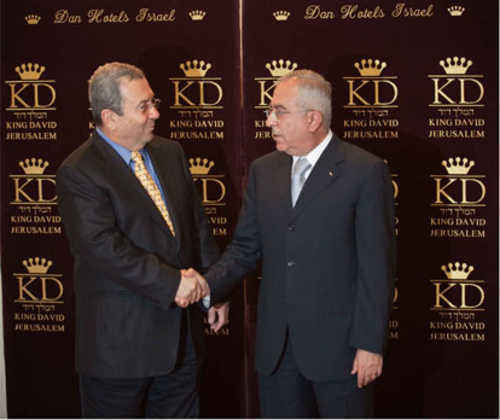 In the photo above, published by Ynet in July, 2010, Fayyad is shaking hands with Ehud Barak at the King David Hotel in Jerusalem. Hamas considers Barak to be a war criminal. Fayyad was, in fact, one of the key people who worked to achieve the unity deal in the first place, according to the Palestinian News Network. But after the collapse of the Tuesday meeting was announced, Fayyad said that he may announce his refusal to head the new government, so as not to be an obstacle to Palestinian unity. However, it's far from clear that the withdrawal of Fayyad from consideration will clear the way for the unity government to proceed, since Fayyad is only a symbol of the larger issue of whether Hamas or Fatah will dominate the unity government. A major dispute erupted a month ago over whether the Palestinian parliament would have to approve a unity government, according to Al-Ahram. Hamas favored requiring parliament's approval, because Hamas members are in the majority. However, a new poll of 1,200 Gaza and West Bank Palestinians conducted by the Palestinian Center for Policy and Survey Research (PSR) shows that public attitudes among Palestinians have changed substantially since the unity agreement was first announced. Prior to the unity agreement, Palestinians were most concerned about the issue of the Hamas/Fatah split. Once the unity agreement was anounced, the concerns about the split were greatly reduced. Thus, now that the unity government appears to be imminent, the poll indicates that a clear majority of Palestinians want the new government to implement the policies of Fatah and the Palestinian Authority, rather than the policies of Hamas. A majority of 59% believe that Fatah and Hamas will succeed in implementing the reconciliation agreement and in unifying the West Bank and the Gaza Strip. For prime minister, Palestinians favor the Fatah candidate, Salam Fayyad, over the Hamas candidate, Jamal Khodari, by a plurality of 45% to 22%. A majority of 61% wants the new government of reconciliation to follow the peace policies and agendas of President Abbas and Fatah, rather than those of Hamas. This poll was published on the eve of Tuesday's meeting, and may have factored into the decision to cancel the meeting. It will certainly strengthen the hand of Mahmoud Abbas and Fatah, although it may cause Hamas to pull out of the unity agreement altogether.